AV Comm.TV Ltd provides custom installation services for residential and commercial clients, consisting of electrical services, home cinema, multi-room audio video, digital tv, smart home solutions, security systems & CCTV. 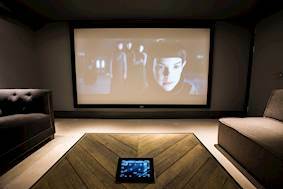 AV Comm was commissioned to install a dedicated home cinema within a Victorian town house, as part of Detail’s city centre Renaissance Development in Glasgow. Interior designers and architectural service company, Detail, designed the luxury accommodation with minimal equipment to be visible. 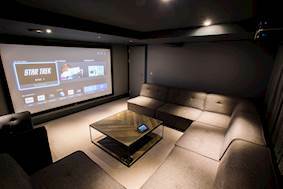 The cinema, set on a new purpose-built mezzanine floor, needed to be suitably stylish for this luxury home, with perfect audio and image quality. 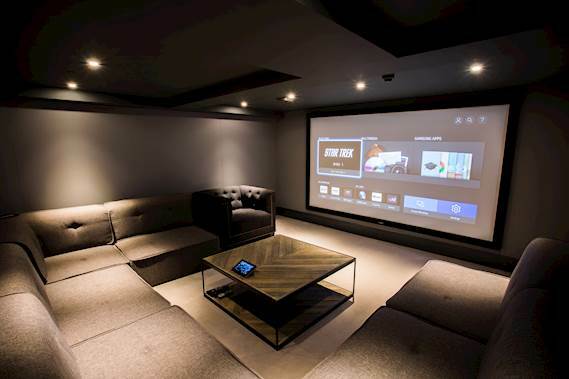 The Glasgow-based AV experts installed an Optoma UHD65 4K UHD projector together with a Cyberscreen Acoustically Transparent 120 inch fixed projection screen from IntoAV Distribution. 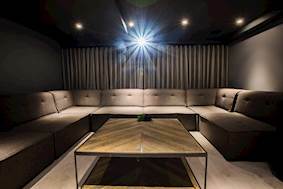 Allan Staig from AV Comm said: “We had the challenge of ensuring the home cinema was in keeping with this stylish luxury development while still within budget. It has sophisticated PureMotion frame-interpolation technology. This advanced processing eliminates motion blur or image judder, even in high-speed action films or fast-paced sports. An RGBRGB colour wheel provides accurate, true to life colour, which together with the projectors sleek black casing and 1,200,000:1 contrast ratio make the projector perfect for dedicated home cinemas. Set-up is simple with vertical lens shift and a host of connection options such as two HDMI ports and Mobile High-Definition Link (MHL) for compatible phones and tablets. In addition, the UHD65 can be turned into a smart projector by connecting an HDMI dongle like the Google Chromecast™ or Amazon Fire TV to access popular media services and stream TV shows, films and video clips, play games and share photos on the big screen. Monitor Audio’s Controlled Performance 7.2.4 in wall speaker system was installed to provide the optimum audio quality. These speakers were then concealed behind the acoustically transparent screen and material that covered the walls. This stylish stretched fabric material from Desmond and Sons not only conceals the in-wall speakers but also improves audio quality within cinema rooms. Completing the home cinema was a Denon Dolby Atmos AV Receiver, Samsung UHD Bluray Player, Apple TV 4K, Sky + HD Box and a URC 7100 Total Control table top touch screen control system, which controls everything. The home cinema was completed in March 2018. URC 7100 Total Control table top touch screen control system.